In 1989, the Federation Internationale de Basketball made the first steps to allow professional basketball players to compete in international tournaments like the Olympics. That broke with the longstanding tradition of the Games being a display of only amateur athletic talent. It also meant that USA Basketball's men's roster stood to be absolutely ridiculously packed with talent, forming a super-team for the ages made of NBA greats that was quickly dubbed "The Dream Team." The squad lived up to the hype. Basketball fans all over the world (not just in America) went wild for 12-man roster that would feature Michael Jordan playing alongside Magic Johnson playing alongside Larry Bird, ad infinitum. (Even the guys at the relative bottom of the list, like Chris Mullin and Scottie Pippen, were already NBA legends.) And when they took the court in Barcelona, the Dream Team did not disappoint, going 8-0 in Olympic play, winning each game by an average of 43.8 points, and securing the gold medal after routing Croatia 117 to 85. All 12 players have long since retired from play. Here's a look at what the Dream Team has been up to in the last 20-odd years. Jordan was so good and so popular that he was handsomely rewarded for his efforts, both as a player and as a paid celebrity endorser for McDonald's, Ball Park Franks, and especially Nike. The Air Jordans line kicked off the players-having-their-own-shoe craze — those kicks still earn him around $100 million a year, way more than the $94 million he earned in total as a player. 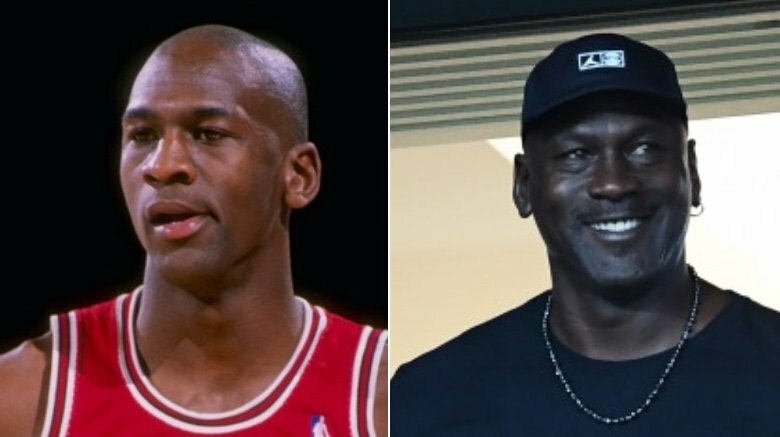 Today, Jordan is literally a billionaire, and he ranks as the third-richest African-American, trailing only Oprah Winfrey and venture capitalist Robert Smith. In 2010, Jordan became the majority stakeholder of the Charlotte Hornets (nee Bobcats), making him the first former NBA player to own a team. It's all so impressive, it almost makes you forget about that time he tried to be a minor-league baseball player. Probably the least flashy superstar in basketball history, Larry Bird had a fun college rivalry with the showier Magic Johnson, which extended to the NBA and made the league exponentially more popular. 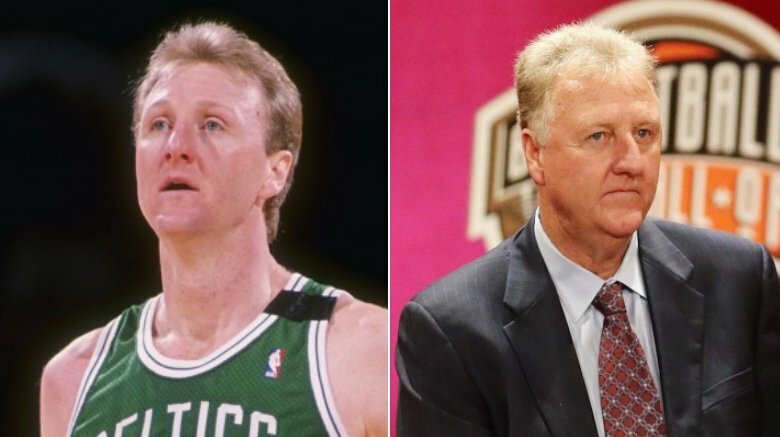 Bird's Boston Celtics faced Johnson's Los Angeles Lakers three times in the NBA Finals in the 1980s. By 1992, Bird's legendary playing career neared an early end, beset as the small forward was by persistent back problems. Bird's last game on a basketball court was the gold medal game of the 1992 Olympics; he retired from the NBA a week later. But he was the king of fundamentals, and he won so many championships (three in all) that Bird's guiding hand was highly sought in retirement. He went on to coach the Indiana Pacers for three seasons (1998-2000), moving on after guiding the team to an NBA Finals loss to (who else?) the Lakers. 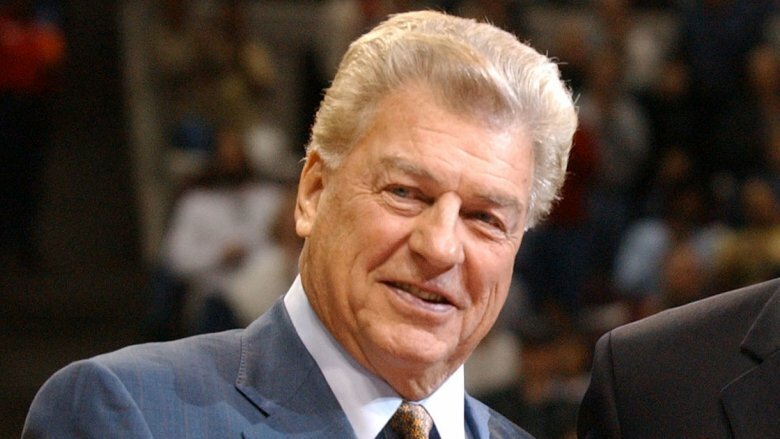 From there, he served as the Pacers' president of basketball operations for more than a decade. 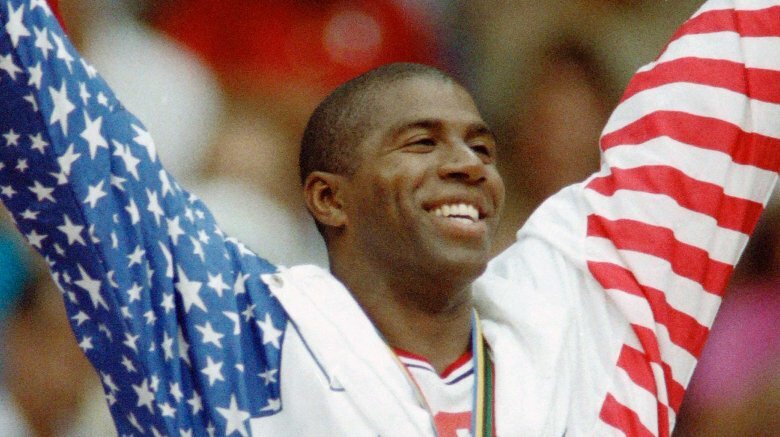 The site of NBA legend Earvin "Magic" Johnson on an Olympics podium packed an emotional wallop. Less than a year before the 1992 Games in Barcelona, Johnson abruptly retired from the NBA after announcing that he was HIV-positive. With the world still in the dark ages with regards to perceptions and management of the potentially fatal condition, it was widely assumed that Johnson would never play again and that he might even die soon. In the years since, he not only survived, but thrived. Over the past two decades, Johnson built a business empire, which has included more than 100 Starbucks locations, a few Burger King franchises, Magic Johnson Theaters, and an investment firm. That's plenty to keep a guy busy (and financially set for life), but he's also dabbled in TV (his talk show, The Magic Hour, lasted two months on the air) and coaching (he notched a 5-11 record as an interim Lakers coach). 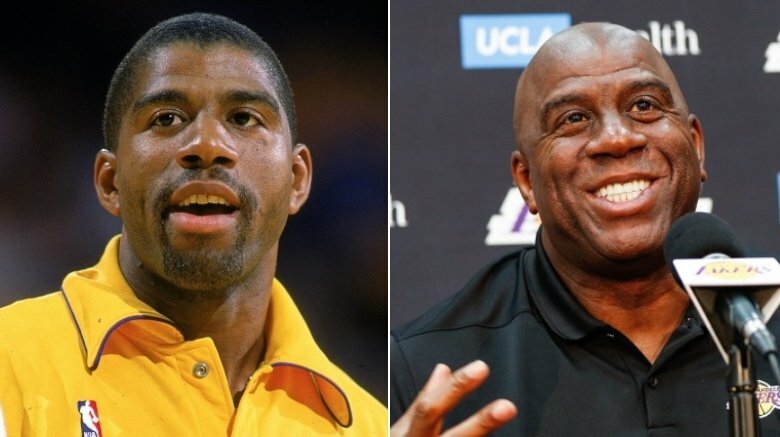 In 2017, Johnson, who led the "Showtime" era Lakers to five NBA championships, became the team's president of basketball operations. It was in that capacity that he successfully (and personally) lured LeBron James to the team. 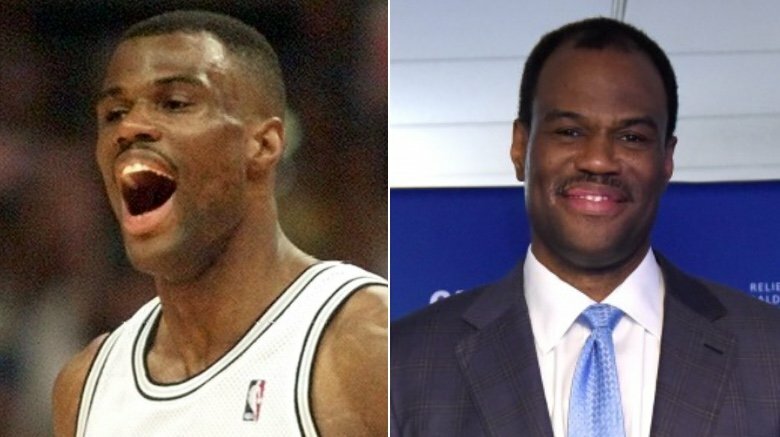 They say that military school (and service) instills the deep discipline necessary to achieve great things in life, and David Robinson is proof of that. The San Antonio Spurs great attended the U.S. Naval Academy and deferred playing in the NBA because he had to complete his military service. Once he got to the NBA, his leadership and naval background earned him the nickname "The Admiral." He also proved he was worth the wait, named to ten all-star teams and selected as league MVP in 1995, leading the NBA in scoring in 1994, and guiding the Spurs to two championships. He retired immediately after winning the second one in 2003. As far as the Olympics go, Robinson medaled for USA Basketball three times — golds in 1992 and 1996, following a bronze back in 1988. After his playing career ended, Robinson just kept achieving at a very high level. He earned a master of arts in administration as a way to help himself better handle his many pursuits, including The Carver, the San Antonio charter school he co-founded, and the Admiral Capital Real Estate Fund, a commercial real estate company worth as much as $100 million. He also owns a Jaguar and Land Rover … dealership. Charles Barkley possessed one of the most oversized personalities in NBA history, so it's easy to overlook his remarkable statistics. 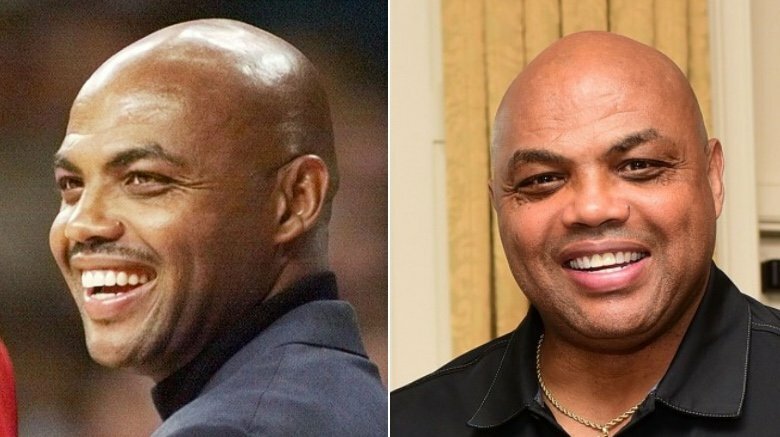 He's one of only four players (alongside Kareem Abdul-Jabbar, Wilt Chamberlain, and Karl Malone) to amass 20,000 points, 10,000 rebounds, and 4,000 assists — making Barkley one of the best and most versatile players to ever hit the court. The 11-time all-star won the NBA MVP award in 1993 with the Phoenix Suns, whom he joined after a long, championship-free tenure in Philadelphia left him frustrated. Barkley, aka "Bread Truck," aka "Food World," aka "The Crisco Kid," aka "The Round Mound of Rebound" (he was one of the more heavyset NBA stars, you see), is probably the most consistently visible member of the Dream Team today. He's softened considerably from his NBA days, when he was an aggressive power forward who publicly lashed out about his distaste for how he was expected to act like a role model for kids, now voraciously but good-naturedly ribbing his panel mates on Inside the NBA, TNT's pre-/mid-/post-game show. He's also just about the best athlete guest host in SNL history, hitting the show the fourth time in 2018, for, as he said in his monologue, "no reason." He's even considered politics, nearly running for governor of his home state of Alabama in 2008. 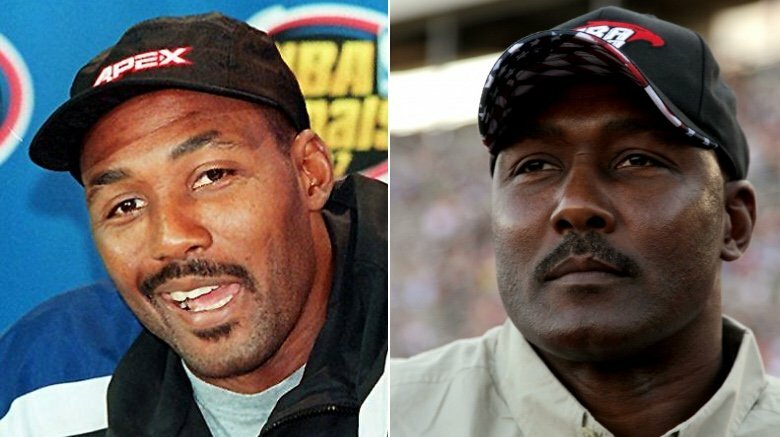 Everybody called Karl Malone "the Mailman" because, like those noble letter carriers of the U.S. Postal Service, Malone "delivered" virtually every day of his career. Apart from his rookie year and final year, his points-per-game average never fell below 20. A two-time NBA Most Valuable Player, he scored a total of 36,928 points, second on the all-time list behind Kareem Abdul-Jabbar. Malone tops the lists of both free throw attempts and defensive rebounds, adding to the argument that he's probably the best player to NBA history to never win a championship. Nobody on the court had more hustle than Malone did, and few ex-players work as hard or at as many things as Malone has done after he quit playing. He retired, but only from the NBA. Among the things Malone has gotten up to since his playing days ended in 2004: owning a string of Jiffy Lubes, a used car dealership, a new car dealership, a couple Burger Kings, a gas station, an auto parts store, an auto body shop, and a commercial real estate company. Born and raised in rural Louisiana, Malone has always enjoyed the "country life," and today he's got his own cattle ranch, some several thousand acres of forest land, and a deer farm. He's also served on the National Rifle Association's board of directors and takes paid guests on hunting excursions. 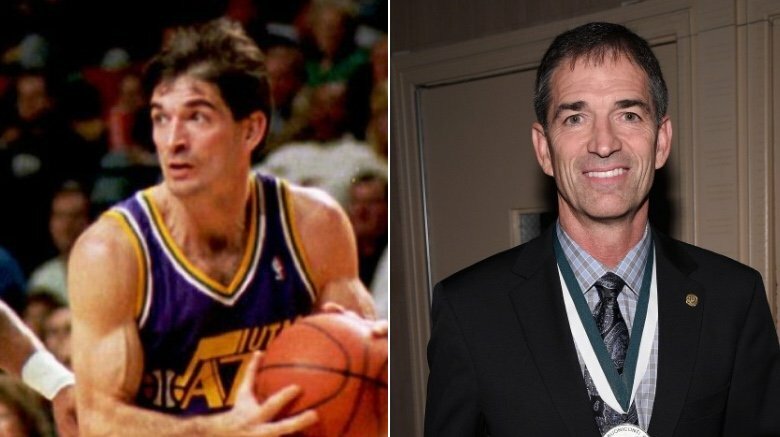 John Stockton, the dutiful, longtime Utah Jazz point guard, was probably the hardest-working guy in the NBA. Relatively small (he stood just over 6 feet tall), Stockton teamed up with Karl Malone for a one-two punch that helped consistently propel the Jazz to the playoffs, which included two appearances in the NBA Finals. He retired in 2003, and he's still the all-time leader in assists, with 15,806. (He led the league in that stat for a staggering nine straight seasons.) Stockton was a decent scorer, but the Dream Team had enough basket-makers — it needed the greatest player Gonzaga University ever produced to set up those shots. After his 19-year NBA career wrapped up, Stockton returned to his native Pacific Northwest and quietly coached a lot of basketball. At one point, as he told Sports Illustrated, he helped out with "seven or eight teams at once," including high school and youth squads. In 2015, Stockton joined the coaching staff of Montana State University as an assistant coach for the women's team. Michael Jordan couldn't win six titles all by himself — he literally couldn't have done it without Scottie Pippen. The somewhat unheralded second option for the Chicago Bulls would've been the undisputed star on any other team, seeing as how he routinely averaged 20 points per game (and was among the league's best ball-stealers, too). Pippen left the Windy City for stints in Houston and Portland before walking off the court for good in 2004 … at least in North America. He briefly came out of retirement to play in Scandinavia at 42. The poor guy also lost a lot of money. His financial adviser, Robert Lunn, got a three-year prison sentence for committing various acts of fraud, including forging Pippen's signature to secure a $1.4 million loan to himself. 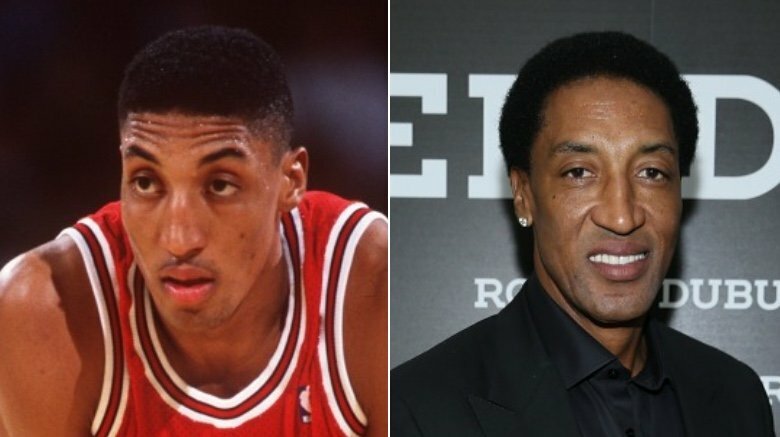 In an ugly incident in 2013, Pippen allegedly assaulted a man outside a Malibu, California, sushi place because he wanted a picture with the NBA legend. In lighter news, Pippen recently scored a cameo role as himself on an episode of the TV version of Lethal Weapon. 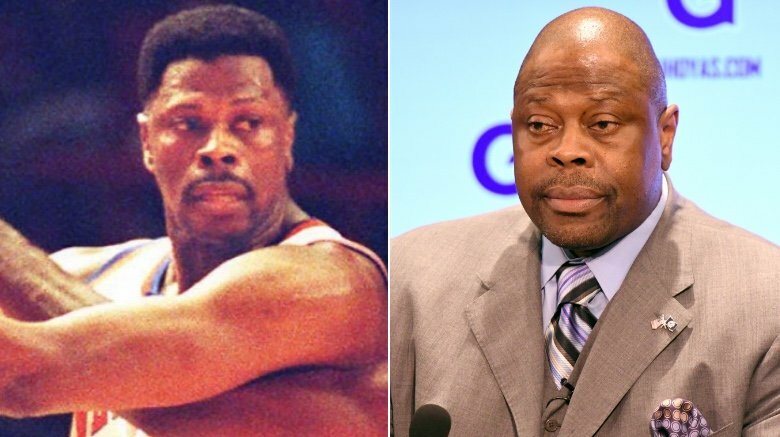 Patrick Ewing never won that elusive championship ring, but he was inarguably among the NBA elite, a former Rookie of the Year and 11-time all-star who reached the finals twice with the New York Knicks. Over his 15 years with the team, he averaged a double-double: 22.8 points and 10.4 rebounds per game. Before his storied NBA (and Olympics) career, Ewing had a legendary run at Georgetown University in the '80s, leading the Hoyas to a national title and earning himself honors as the national college player of the year. He also nabbed himself a spot in the history books as the #1 pick in the 1985 NBA Draft. Ewing played for John Thompson (who coached the Hoyas for 27 seasons), and in 2017, shortly after the school fired his son, John Thompson III, Georgetown turned back the clock and hired Ewing to be the head coach of the men's team. "It's great to be the head coach at Georgetown," Ewing said. "It's great to be a head coach, period." After he retired from play in 2002, Ewing had come extremely close to becoming a head coach in the NBA, but he never got his shot, sitting down-bench as an assistant in Washington, Houston, Orlando, and Charlotte. Go get 'em, Patrick. Clyde "The Glide" Drexler and his smooth style of play prevented the rest of the NBA from forgetting there was a team all the way out in Portland, Oregon, and at times, he gave Michael Jordan a run for his money as one of the best shooting guards in the league. The 10-time all-star averaged as many as 27.2 points per game at his peak with the Blazers, and over the course of his 14-year stint in the NBA, a team with Drexler on it never once missed the playoffs. In 1995, the Trail Blazers got rid of Drexler, trading him to the Houston Rockets. But that was essentially a homecoming for Drexler — with the University of Houston, Drexler had made two Final Four appearances back in 1982 and 1983. Plus, Drexler was reunited with his old college teammate, Hakeem Olajuwon, and he came to H-Town just in time to help the team win its second straight NBA title. 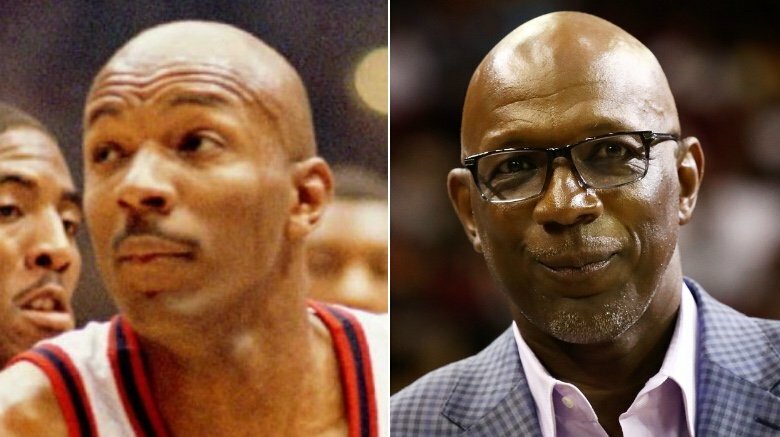 After retiring in 1998, Drexler stayed in Houston, where he helped out with Drexler's World Famous Bar-B-Que, a local institution founded in 1967 by Drexler's uncle. In addition to managing his real estate firm, Drexler Holdings, the Glide also didn't get too far away from the Rockets — he still provides color commentary for broadcasts of home games. Before the current era of the Golden State Warriors, in which the team seems to have every future Hall of Famer on its roster at once, the last golden age for the team came in the late '80s and early '90s, when it was a formidable opponent for Western Conference powerhouses like the Los Angeles Lakers and the Utah Jazz thanks to guys like Mitch Richmond, Tim Hardaway, and especially, Chris Mullin. The all-star small forward averaged 18.2 points per game over his career (1985-2001), where he was proficient at nailing three-pointers and free throws. After years with the Warriors and a stint with the Indiana Pacers, Mullin played his final season back in Golden State. He soon joined the team's front office, but in 2015 he went "home again" once more, as it were. 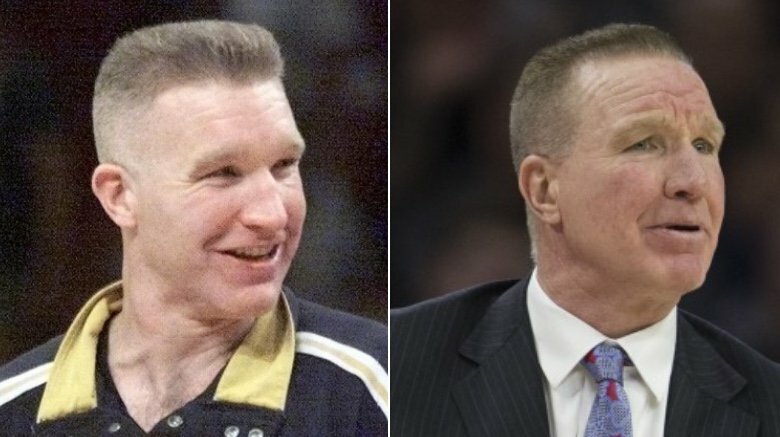 Mullin took over as head coach of the men's basketball team at St. John's University, the Queens, New York, college where he played back in the '80s. Before the Dream Team, the USA Basketball squad comprised the best amateurs in the country, meaning college players. As a nod to that history, team organizers selected one collegiate star: Christian Laettner. The two-time All-American helped bring two national titles to his school, and in 1992, the Associated Press named him Player of the Year, shortly after a season where he scored an average of 21.5 points per game. 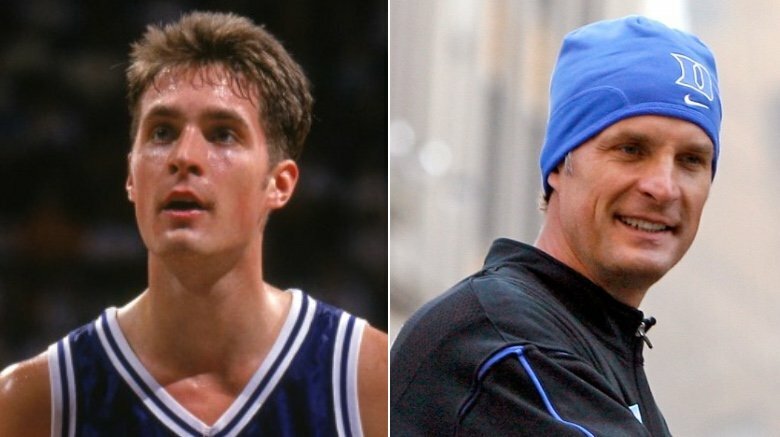 Laettner had the numbers to earn his Olympics spot, but some basketball fans at the time were confused that Laettner got the call over college contemporaries like Shaquille O'Neal and Alonzo Mourning … feelings that grew more justified when O'Neal and Mourning became NBA superstars and Laettner did not. He made the all-star squad just once over a 13-season career where he played for six different teams and averaged a respectable 12.8 points per game. Usually, when Laettner's name has made the headlines, it's been for something embarrassing and financial. In 2012, outlets reported that Laettner's real estate development career was in big trouble — too-quick expansion and the real estate bubble bursting left him as much as $30 million in debt. Facing bankruptcy and angry creditors by 2016, Laettner reached a settlement to pay $10 million to the people he owed money to, some of them former teammates and friends, such as Duke's Johnny Dawkins and fellow Dream Teamer Scottie Pippen. After Barcelona, Daly went right back to the NBA, albeit with the New Jersey Jets instead of the Pistons. Daly led the usually lowly Nets to back-to-back playoff appearances before retiring for the first time. In 1997, the Orlando Magic lured him back for a couple more years. Sadly, in 1999 Daly passed away at age 78, shortly after beginning treatment for pancreatic cancer.